I've hear whispering of something new, but nothing more. But comment spam is creeping in now and there are still no categories. Still waiting for some type pf conversation with them to start. Phil, I share your sentiments. For example, The mobile interface is forked into two awkard approaches -- one allows pictures, one doesn't; one requires you nuke your existing blog, one is compatible. Neither is really attractive. Then there are the feed issues. I have encountered multiple Blogger feeds with unparseable XML -- can't even be viewed in Firefox. The blog posts weren't weird, just Blogger doing weird things with very ordinary blocks of text and creating invalid XML. I posted about this on their newsgroups months ago, and sent in a support ticket. No dice. The features remain starved on a very basic level. For example, you can't sort your archive links reverse chronologically like your weblog. You can't put your archive links on their own page. You can't create a page that's not a blog post, or a blog post that doesn't show up on the main page. You don't get categories or tags. 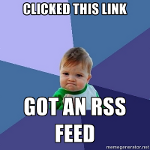 You can't have RSS feeds. You can't host your own domain on blogger's servers, even if you're willing to pay. The template language is barbaric. And yet ... blogger is one of the best services out there. Its mobile intergration is still ahead of TypePad. It's S/FTP abilities are simply unmatched and surprisingly well integrated. Nice photo capabilities. Responsive servers for the most part. Very speedy page serves. It really just feels like they stopped doing any real work on Blogger at some point. Maybe they _are_ responding to spammers, but with Google's massive hiring binges I am really surprised they can't do more to improve basic functionality. Odd, as you say, that the service has not kept pace with the field. As for upgrades and additional services, there are a number of users investing in Blogger, and working to extend the capabilities of their blogs. See the Blogger Hacks Wiki for examples of some additional user-developed tools. the one good thing though is that you kind of know that blogspot.com content is going to be hosted indefinitely, forever since google is so big. whereas the smaller services are subject to bankruptcy or whatever. maybe canter has the right idea, write once, publish to multiple locations. the only problem with that is when you want to link to your own posts etc. it kind of breaks things. also comments are hard to distribute properly across multiple blogs. You've summed up my sentiments exactly. With the rest of Google now AJAX-ified the clunkiness of Blogger is becoming more apparent. I wonder if it's simply because Blogger was already such a large operation when it was acquired by Google, so it's remains a fairly independant entity? Stale is the word. Which leads me t ask where best to transfer? Hope to learn about new blog apps that can be cloud-hosted.